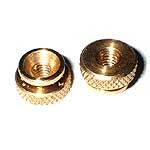 Original style brass nuts for the top of the Champion spark plug. Set of 4. Made in USA. (Will not fit Motorcraft or Autolite plugs). A good U.S.A. made spark plug. Won't pass judging standards if you are showing your car but for the driver, the price can't be beat! Plug comes with gasket and screw on caps. Champion spark plug for the 1928-34 four cylinder engines, plus the first version of the Flathead V8 in 1932. This is our most popular Model A Ford plug for the every day car. They perform well and look great. If you want the next best thing to the original Champion 3X plug, this is it. If you want the best, here it is. The original style 3X two piece style plug for the 1928-34 Ford Model A and Model B. Price is Each. 1928-34 Spark Plug Adapter. Use these on your model A if you want to use modern 14mm spark plugs. Just screw these into your head, and you can use any 14mm spark plug. Also Ideal for compression testers. Made in USA. Price each. This adapter fits the spark plug pipe thread in the Model T cylinder head, to accept a compression tester, or modern 14mm spark plug. Made in USA. This is a low priced Motorcraft spark plug for the Model T Ford and is a non-original style replacement. It still has the 1/2" pipe thread, so there is no need for any adaptors in your Model T Ford. Price is each. If you want the best for your Model T Ford, this is the one. This is the two piece plug as originally fitted to the Model T. Price is each. Spark Plug connectors 1928-31. The brass strips that run from the spark plugs to the distributor body. Set of 4. Made in USA. 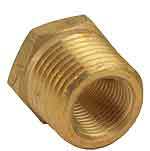 The offset style of plug connector. These were correct from June of 1930 onwards until 1934, but will fit all of the Model A. The 3 13/16" long brass strips that run from the spark plugs to the distributor body. Set of 4.